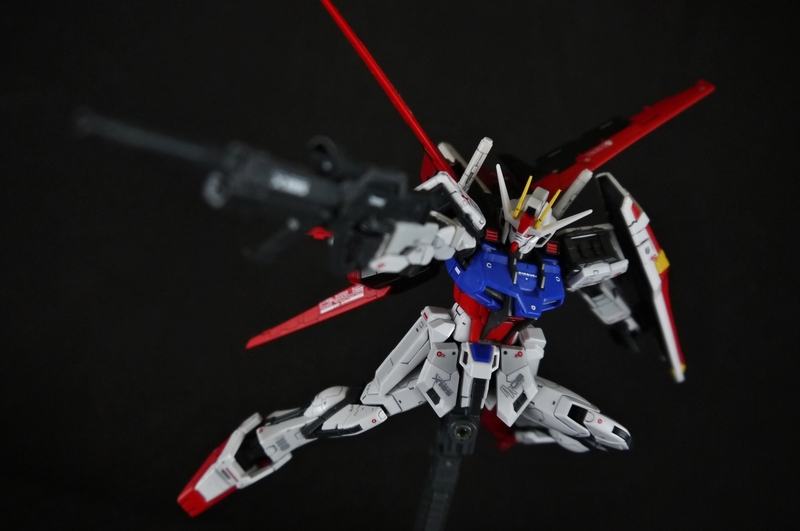 As the second Real Grade kit I’ve had a chance to build, and currently the only 1/144 Gunpla kit in my collection, the Aile Strike is the byproduct of a bulk buy for a RG group build with some fellow guntokas. 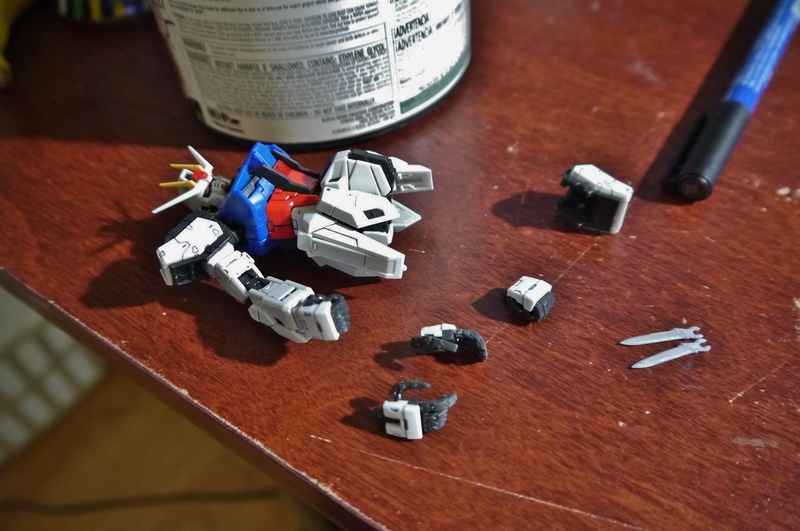 As I mentioned in the initial post about our group build adventure, the memory of a botched RG RX-78-2 that I built a few years back still haunted me through the process of working with the Strike. This will likely be my last RG build for either a while or ever. Not that there was actually anything particularly wrong with this kit; it was actually a pretty good build at a very nice price point, but after working with the microscopic 1/144 scale once again I am reminded of why I took my 1/100-only oath. I had covered a bit of the Work in Progress in the first group build post, where we all built at my buddy’s house, but it goes without saying that we didn’t finish there. As with every Strike variant that’s come out over the years, the Armor Schneidors still come molded in a different color! They couldn’t get it right with the Perfect Grade, so I suppose there was no saving the Real Grade. This time they’re white instead of the usual inner-frame gray, which is an improvement but still missing the mark. Not that it’s a big deal, but for kits like these which really shouldn’t need any color correcting, you figure Bandai would at least make them light gray/non-plated silver or something. I had a royal disaster the last time I worked with RG hands; the absolutely microscopic fingers that still attempted to be articulated threw me for a loop. 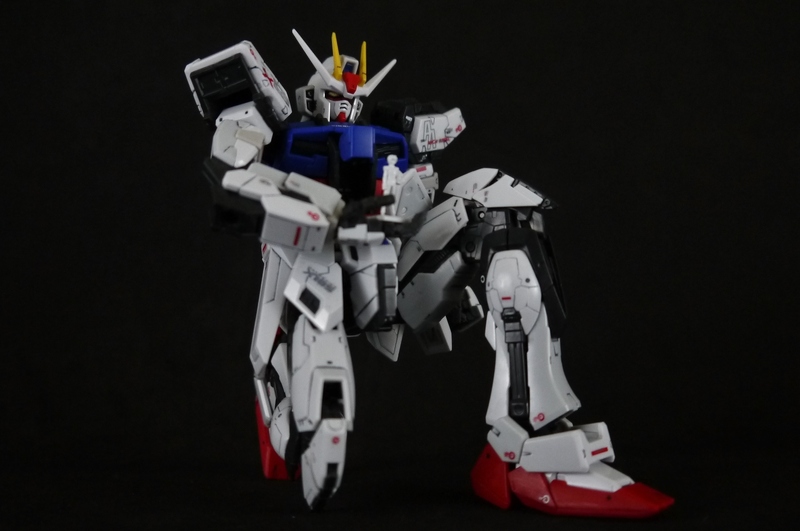 Thankfully I didn’t encounter many problems with the Strike; they appear to be the same type that were used on the RX-78-2, but I just like to think I went into these with more caution than I did before. Much more complex assembly than your garden-variety HG. 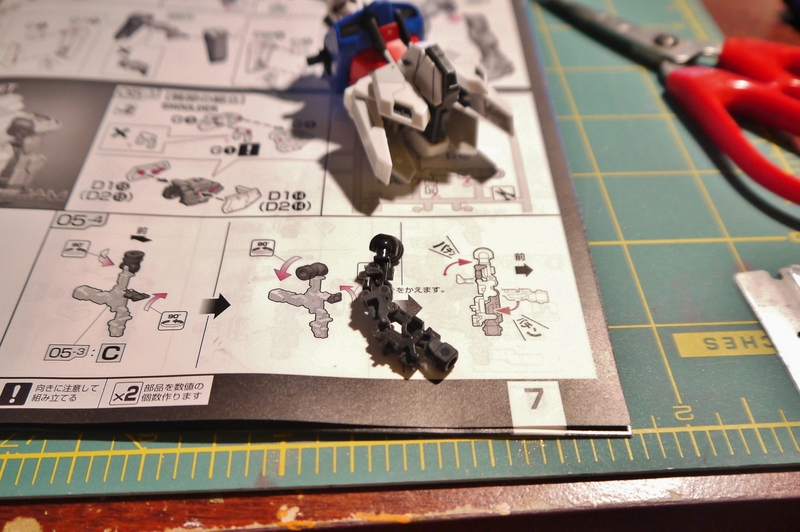 Like other RG’s, there is a good degree of two-tone plastic going on here, hence why so many parts are separate. 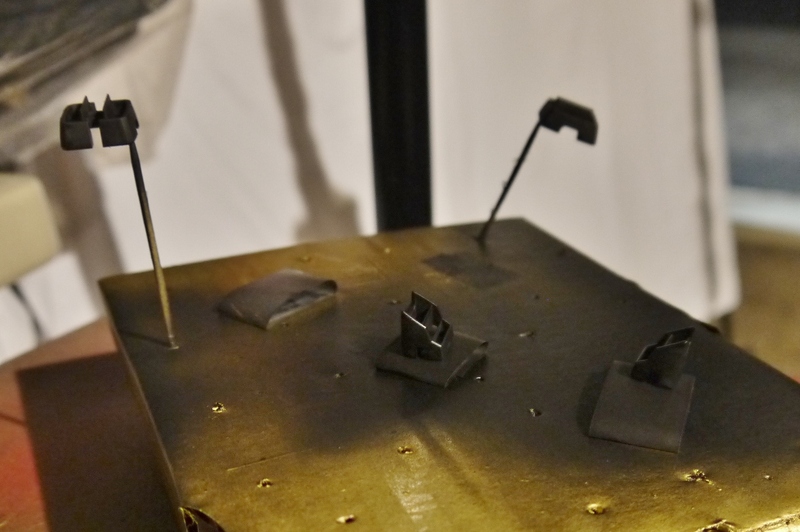 I discovered only after painting the bottom of the feet silver that it was pointless – the paint rubbed off almost instantly the Stike actually put its feet on the ground. Cutting out all the armor pieces for the legs first. The nubs on the colored pieces weren’t too difficult to hide, surprisingly. Bandai’s getting better with hiding them in more out of the way areas. And of course, I cut the armor out first because the frame is simple work. 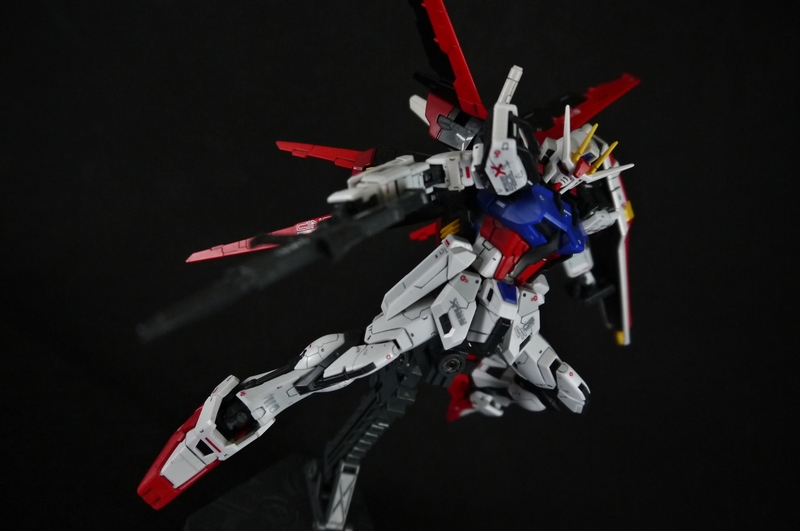 All RGs as I know have their frames pretty much pre-assembled on the runners, joints and all. Just need to cut them out and bend them a bit to ease the joints in before slapping the armor on. It can stand! The bottle of red acrylic was used for covering up the nubs on the feet, which were actually pretty noticeable. Testing out the articulation before putting the armor on. Not bad so far, no knee-popping breakage as I’ve suffered from before. Leg armor going on slowly. One little issue I’ve already noticed is how the shoulders pop right off with a little play. They just clip on, instead of actually being secured to the arm-to-torso area. Getting the detail tools ready. That bottle of Neutral Grey with the obligatory “RG” painted on the cap is actually a custom concoction I created just for the RG Strike, to hide some frame nubs. Since that bottle was running low and I had a new bottle of Neutral Grey already, I poured some black in there and mixed it all up until it matched the color of Strike’s inner frame nigh-perfectly. 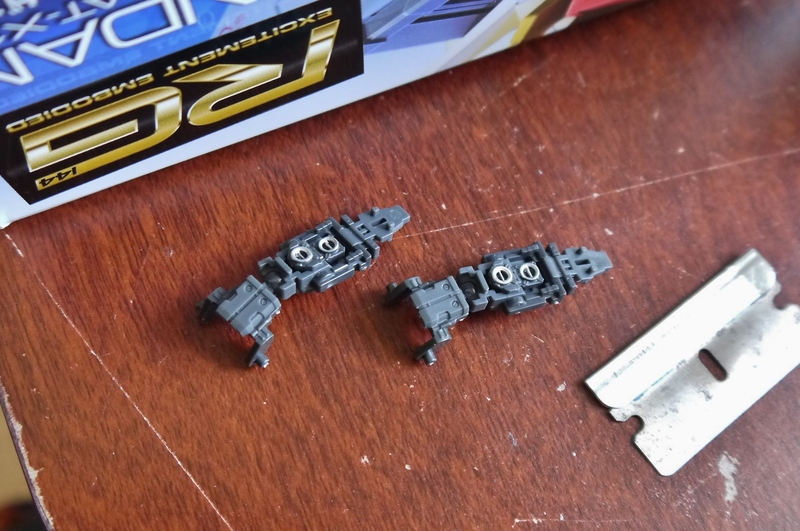 RG frames as I’ve seen are actually much darker than usual Gundam inner frames – they’re almost black, but not quite. Moving onto the Aile Pack. 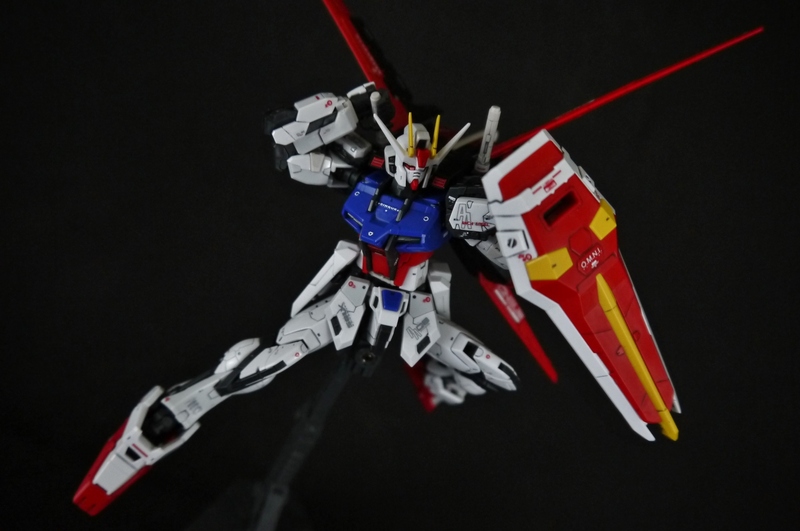 I wasn’t actually all that excited to build this – after I had finished with the Strike itself, I pretty much just wanted to be done with the kit. 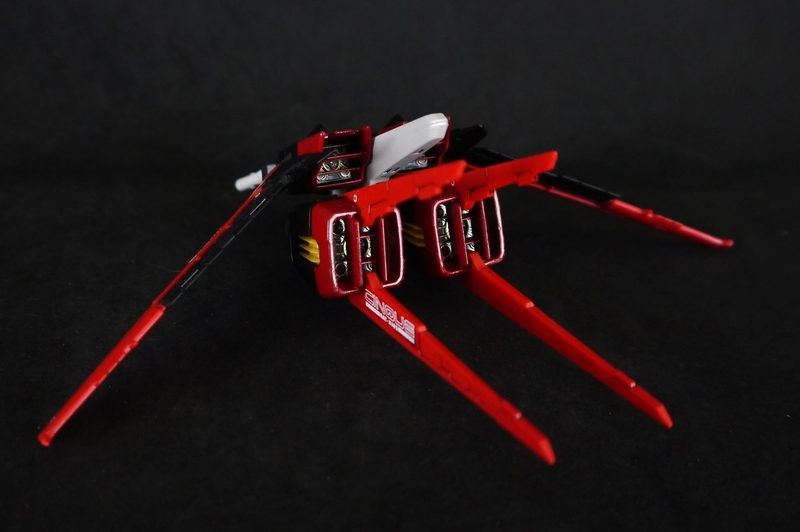 But alas, it does have the rear end of a plane to tack onto its back. Since the Aile thrusters were so incredibly detailed for a 1/144 kit, I didn’t want it to go to waste. 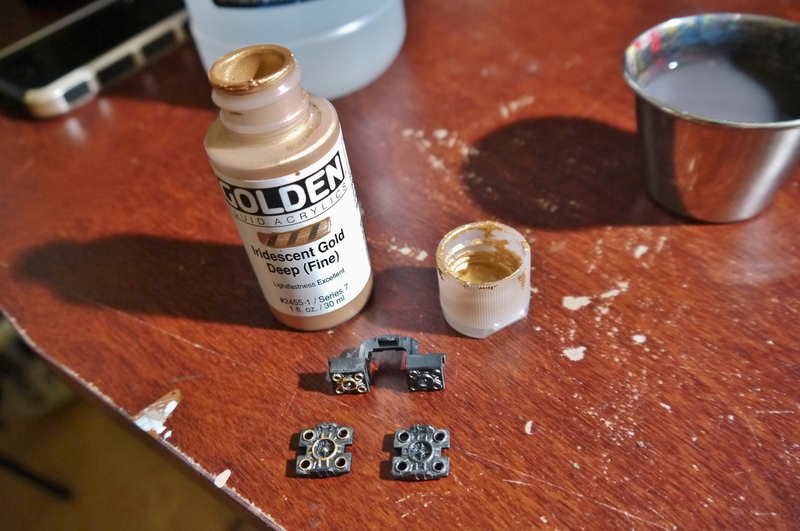 Therefore, I decided to try something fairly new – I drybrushed the actual thrusters entirely in silver, then used some gold acrylic paint to outline the details. The result was actually quite nice; gave it a nice “metal” mechanical feel. 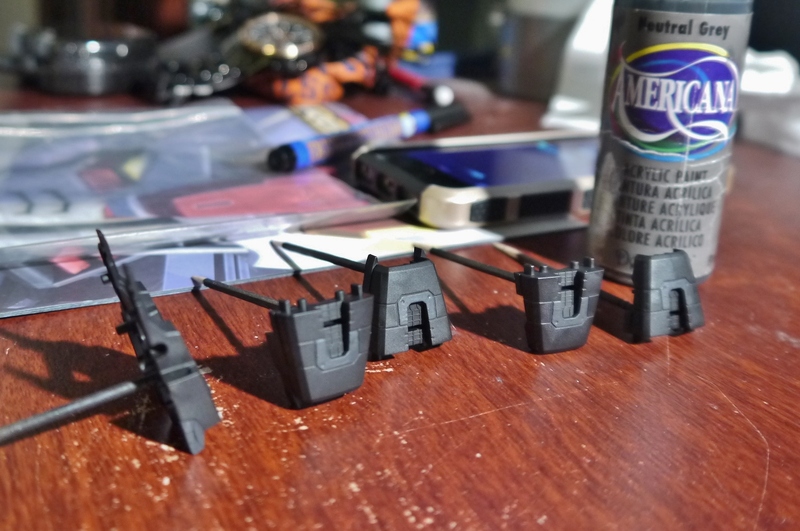 I’m not sure what possessed me, but for some reason I decided to go ahead and spray paint the entire Aile Pack – practically none of it was straight built. I believe the main reason for this was due to the red parts – the nubs on them were pretty horrendous, and due to them being a darker shade of red, I didn’t have the proper paints to hide the imperfections. 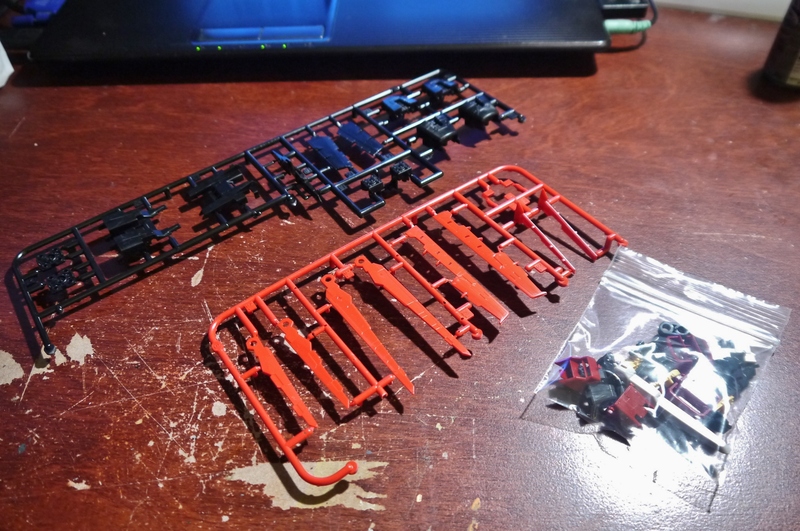 Instead of going out and buying the proper color for nub removal though, I decided to just repaint the red parts entirely. Yes, I’m cheap like that. However, since I didn’t have a dark red spray at the time either, I decided to paint the red parts in black first, then hit it with one thin coat of regular red, to achieve the dark red effect. 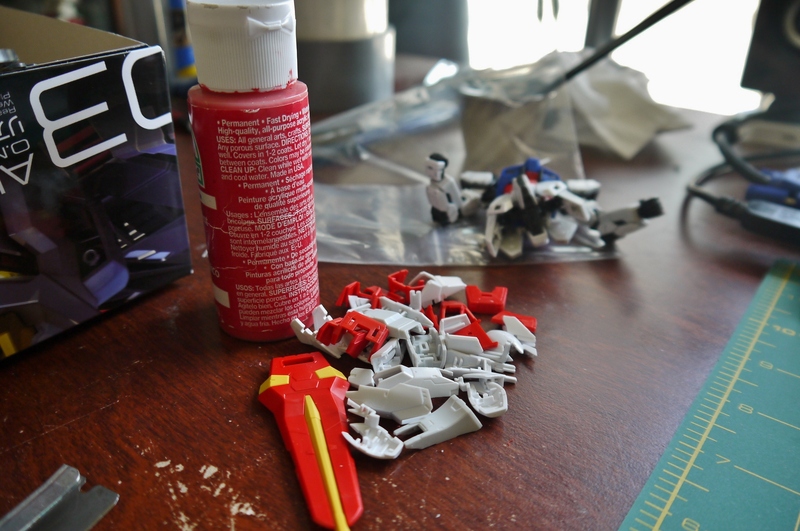 It ended up working, but I botched it a bit in the same manner that I botched up the face of my HG 1/100 Wing Gundam Fenice Custom (which I technically built after this kit) – I tried to assemble the painted red pieces before they were completely dry. I had read somewhere that red paint takes a longer time to dry than most paints, but I had obviously forgotten that little piece of trivia when I was working with the Aile Pack here. As a result of trying to mush the parts together before they were ready, I left some gnarly fingerprints on the red thruster covers. Thankfully I managed to smush them away a bit and it’s hardly noticeable on the final product, but for me the Aile Pack will forever be a disgrace. I’ll be honest – I have no clue why I decided to paint the black parts of the Aile Pack black again, albeit with a matte finish. I did add some detail to the parts with some acrylic, but I don’t think the black pieces warranted total repainting to hide nubs or anything. 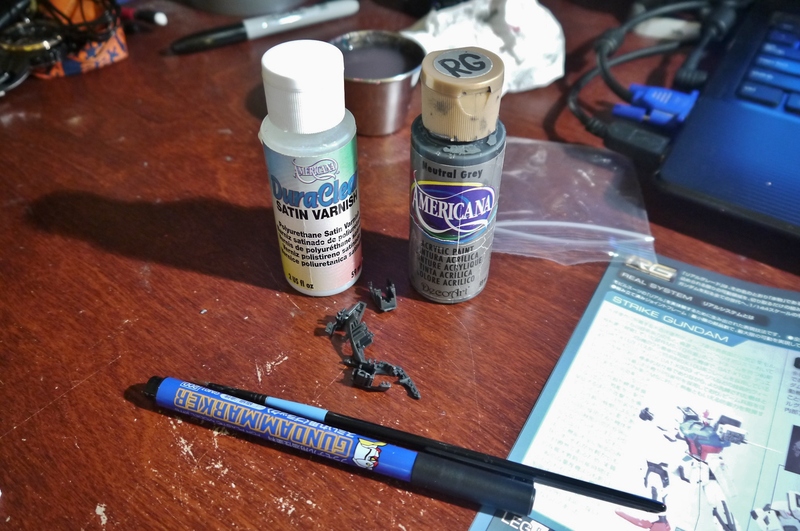 In addition, I also made the same mistake I outlined in my Fenice Custom post – I sprayed the black parts down with a matte paint and proceeded to use a gloss topcoat on it, resulting in a grainy final finish that can be seen on the actual kit. Of course, I didn’t learn my lesson until farther down the line. With everything else pretty much done, the final phase of the build was to apply the markings and decals. I’ve worked with these clear stickers for RG’s before, and found that they peeled and got dirt/dust under them after a while like all stickers. I also know the metallic stickers are supposed to be one of the hallmarks of the RG line, but they look way too tacky for my taste – the little bits of bling all over the suit just don’t do it for me. 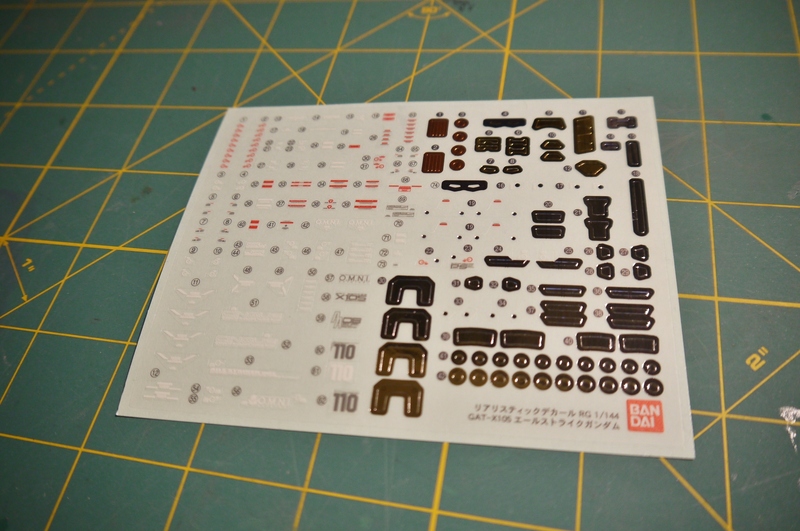 As a result, I ordered a water slide sheet of decals for the kit instead. My buddies and I actually all bought water slides together for each of our kits. 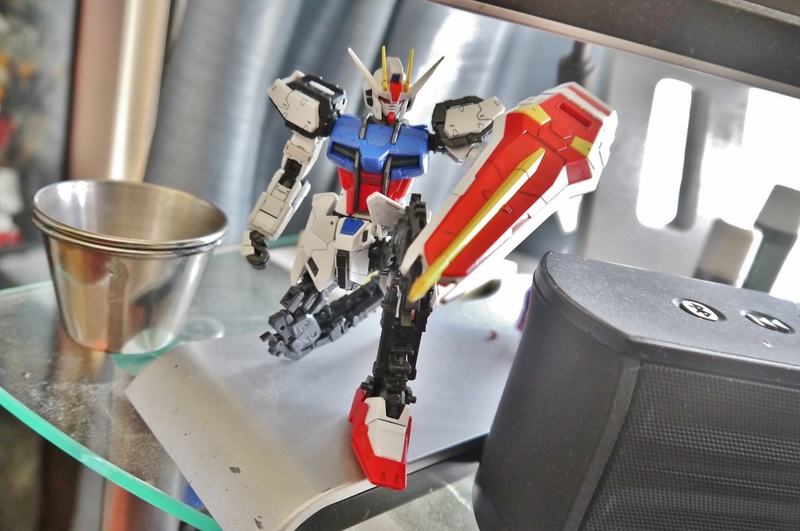 While they were technically a third-party product (Bandai has been lagging on putting out water slide sheets lately) everything went smoothly during application. 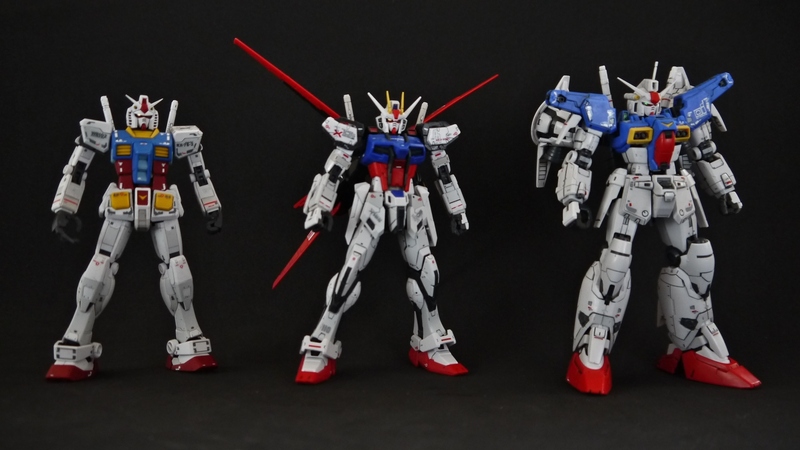 Something I have to appreciate about the RG line is how the kits (including my botched Granddaddy) all look gorgeous and badass just standing there. They really have a handle on the proportions and stance on these suits; very rarely do you have a kit just look good out of the box, but these require no effort. 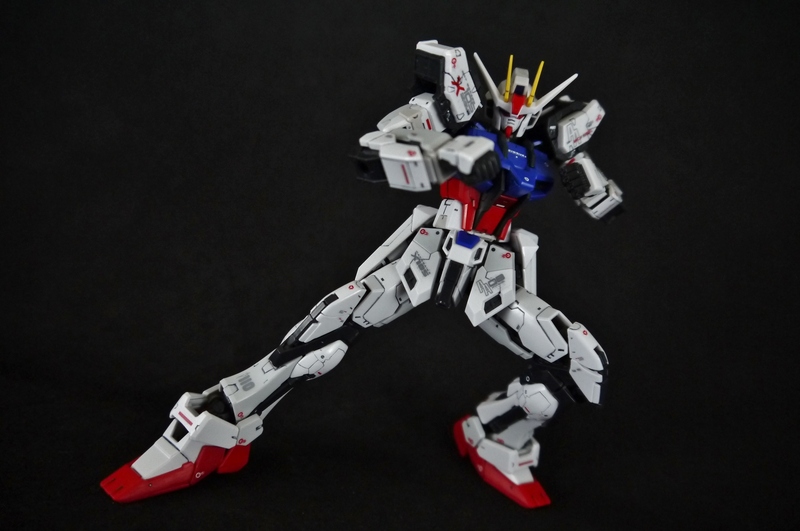 My old RG RX-78-2 couldn’t pull off any more action stances after I broke its knee joint back in the day, but that admittedly didn’t stop it from being a badass just standing around. 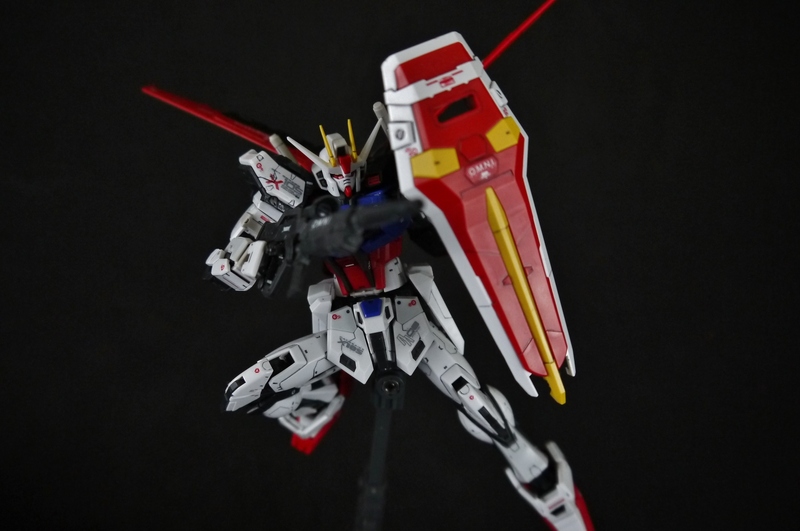 I’ve always liked the Strike’s design bare, and the RG redesign does it incredible justice. I’m loving how simple yet mechanically detailed the kit is. Of course, despite being a 1/144 kit, the cockpit can open, and an absolutely microscopic Kira figure is included. 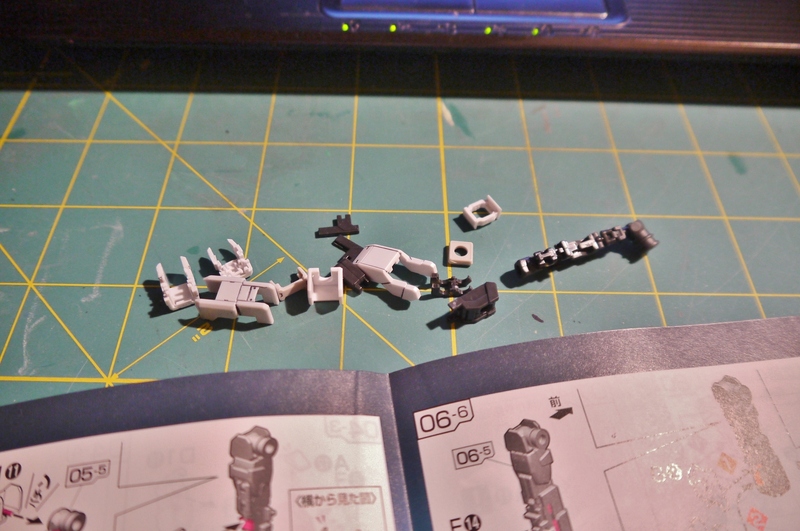 These RG pilot figurines are insanely delicate though – my Kira’s legs shattered on the runner when i tried cutting him out. Of course, I glued him back together, but damn those tiny legs aren’t even a millimeter thick. 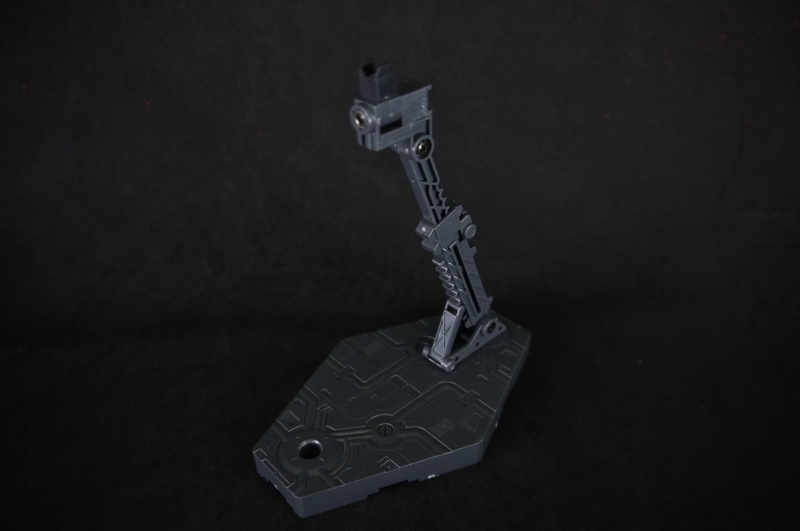 No surprise that RG Strike is incredibly articulated – goodness the movement in the legs and feet are definitely impressive. 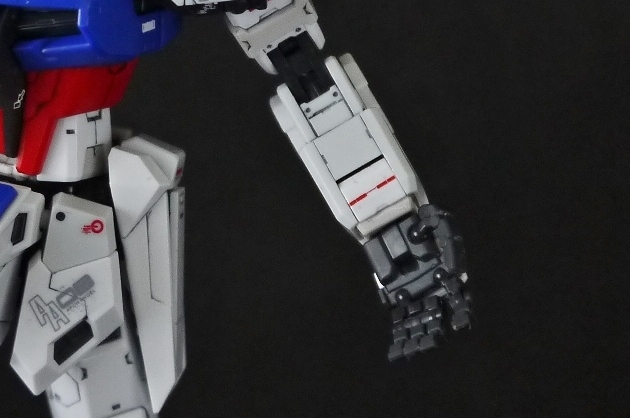 As I mentioned before, I didn’t have too many problems with the Strike’s hands – they’re actually fairly solid, and the fingers stay in their sockets relatively well. Too bad the last three fingers are all tightly linked – would’ve been nice if they at least had one more joint for those, since that segment comes off the most often. Big kudos for the armor separation gimmicks that are integrated with the articulation – notice how the thigh and forearm armors separate when the limbs are pushed out. 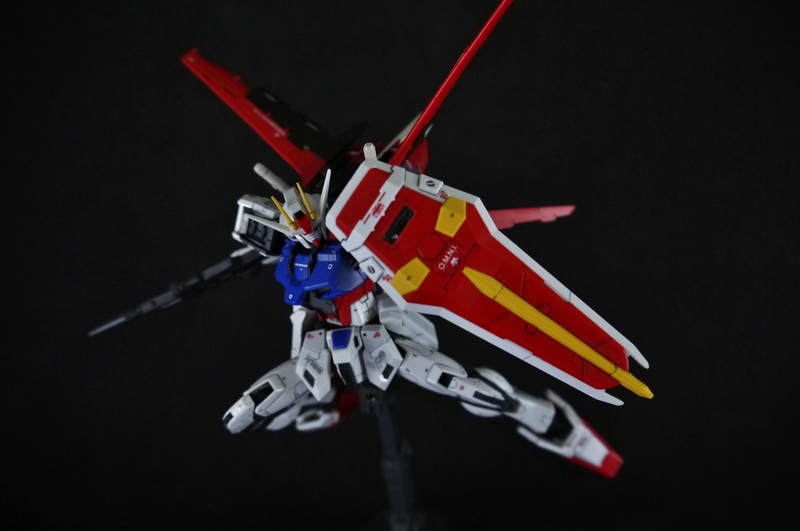 Even stuff like this is sparse on MG kits. 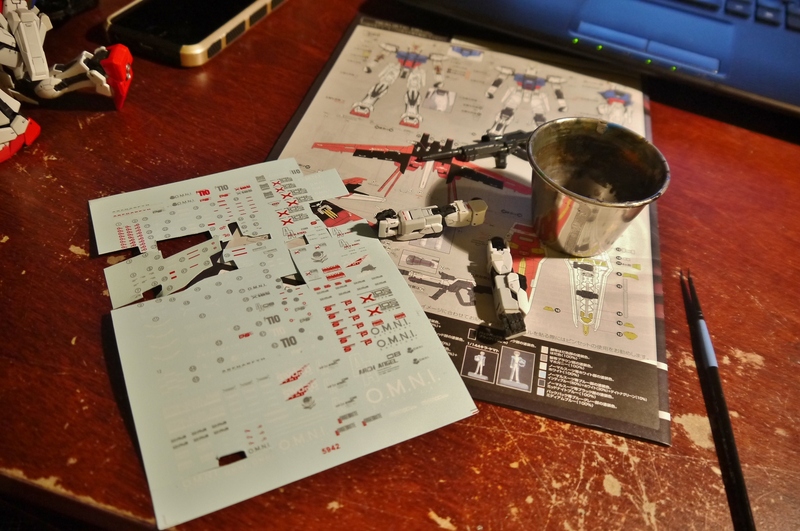 Unfortunately, the only area on this kit that I actually messed up on minus the slightly redeemable Aile Pack was the one Armor Schneider combat knife – given how tiny some parts of this kit are, I’m honestly surprised I didn’t break more pieces. 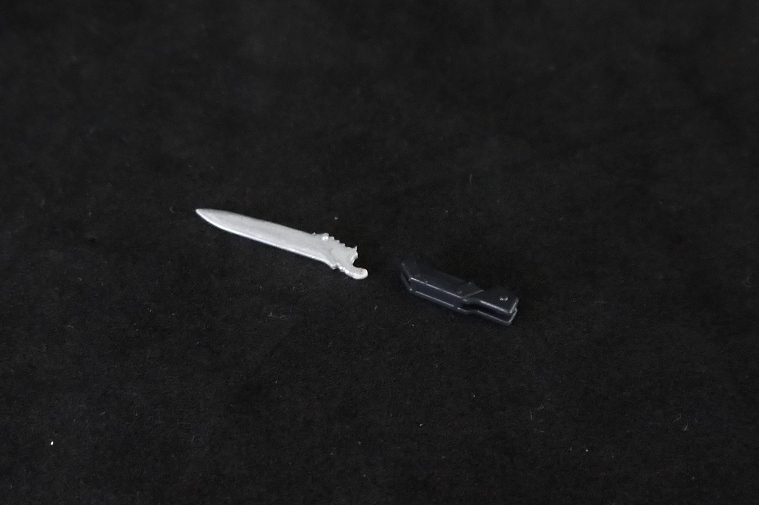 Alas though, it was the one piece of Strike’s little knife that ended up suffering such a cruel fate, and the broken end couldn’t be glued back on due to it being a tiny moving piece. As a result, the one Schneider is pretty much doomed to sit in storage inside the side skirt forever, since it can’t hold its form as it is. I could’ve glued it into a permanently deployed position, but opted not to. Strike’s only got one knife to play around with now. The completed Aile Pack. It didn’t come out too badly in the end; you really have to look for the imperfections on the thruster covers, though they didn’t turn out to be as dark a red as I would have wanted. Fully equipped and ready for action. 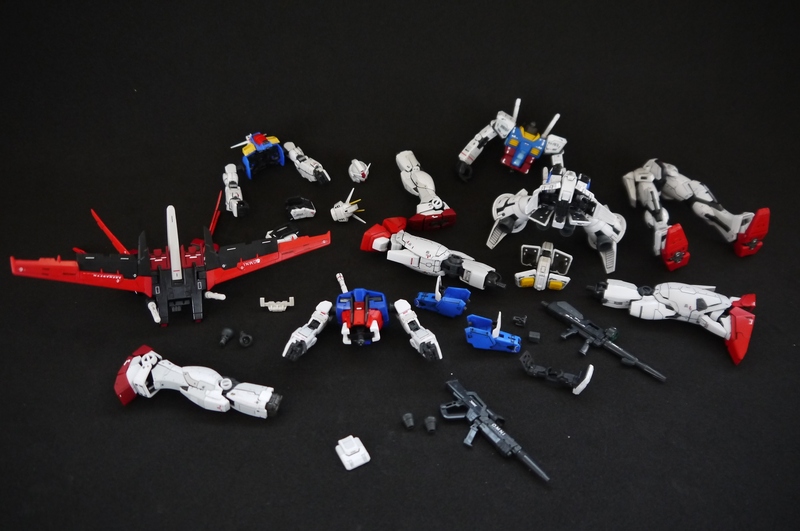 A look at Strike’s accessory layout. 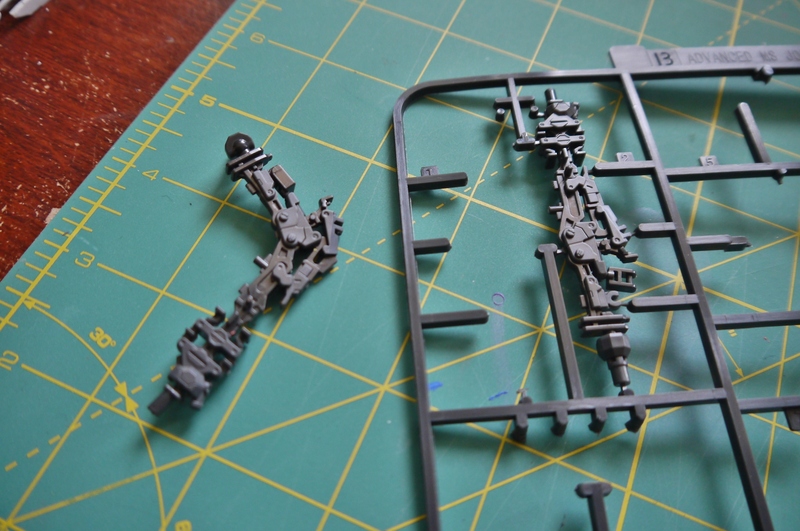 It comes with all the essentials that could really be called basics for mobile suit armament. Beam rifle, shield, two beams, a 1/144 Kira pilot figure, a pair of closed fists, a pair of articulated manipulators, and two and a half pairs of beam saber hilts. That last one made me do a quick double take the first time I noticed it out-of-box too. 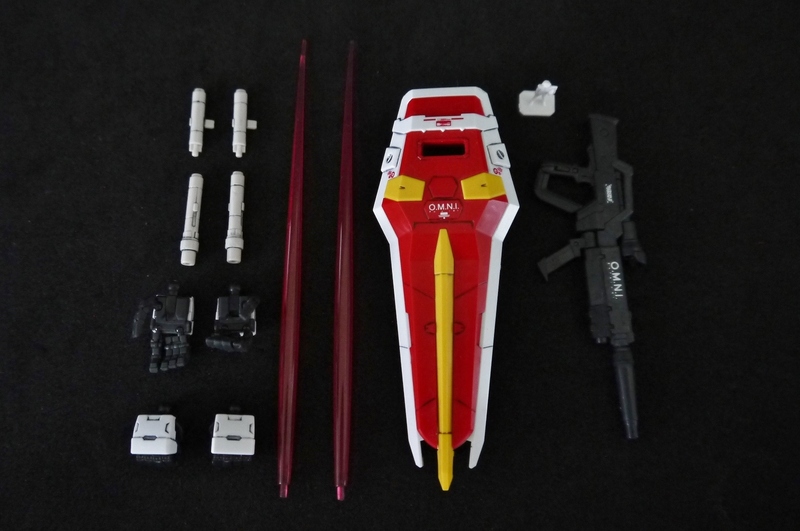 The beam saber hilts themselves are made up of two pieces each, the emitter at the tip and the actual hilts. 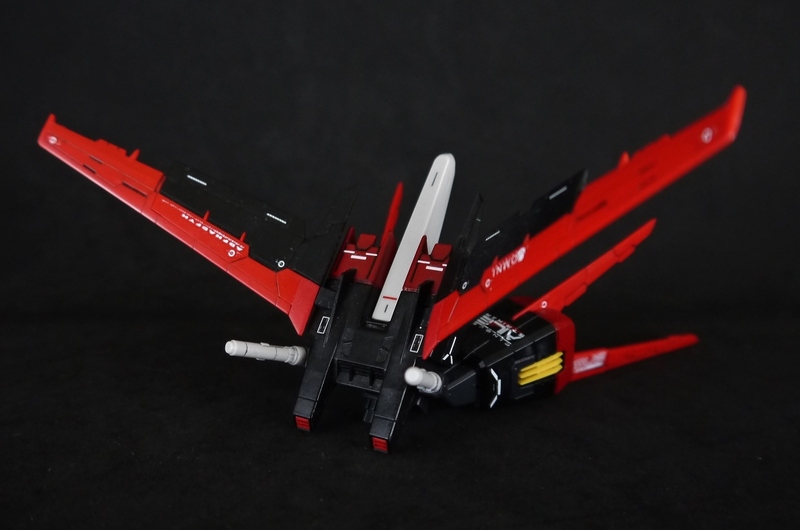 Bandai decides to include only one pair of tip emitters but two varieties of hilts – one with a peg for wielding and another for storage on the Aile Pack. Given how tiny the emitter tips are, I don’t understand why they couldn’t have just included another set of tips so we didn’t have to swap parts for the beam sabers, or just molded them all in one piece. Rifle and shield, basic Strike armaments. Nothing we haven’t seen before, though the RG does pose exceptionally well with them. 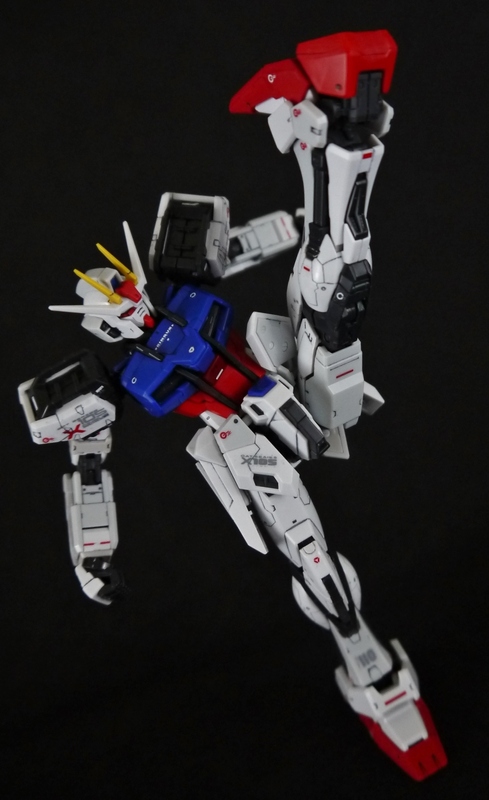 The flex and range of the limbs is most impressive, makes dynamic posing much easier. The beam rifle has a little peg that flips up from inside the handle that pegs into Strike’s palm for a secure grip. 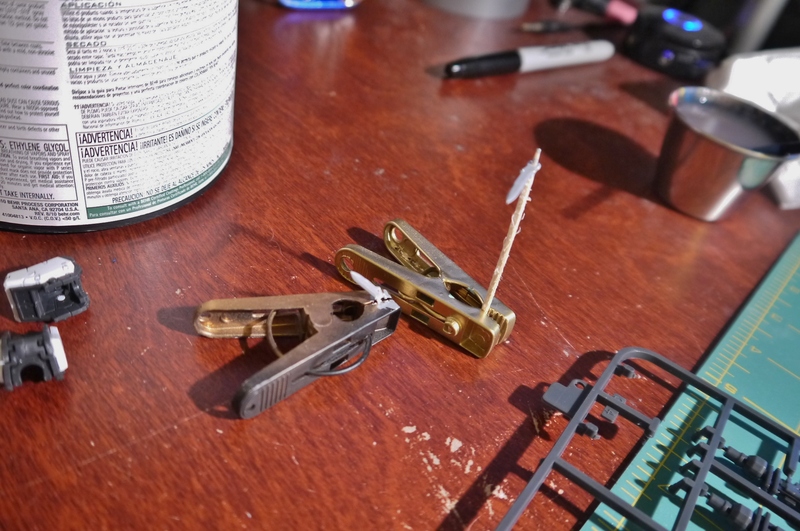 For once, these pegs actually work quite well. I should also point out that I didn’t like the white on the beam rifle that the RG Strike decided to sport for no reason – I liked the traditional all-gray rifle, so I painted mine accordingly. As for the shield, I painted the underside all gray instead of lining it, mostly just because I’m lazy. The rest of the kit already required some pretty crazy lining given the abundance of detail; I couldn’t be bothered to do the same for the underside of the shield. Naturally, it had to be done – STTTTRRRRRRIIIKKKEEEEEEE KIICCCCKKKKK!! As usual, there’s nothing truly remarkable about these run-of-the-mill mobile suit weapons, but Strike sure as hell can look badass handling the blades. 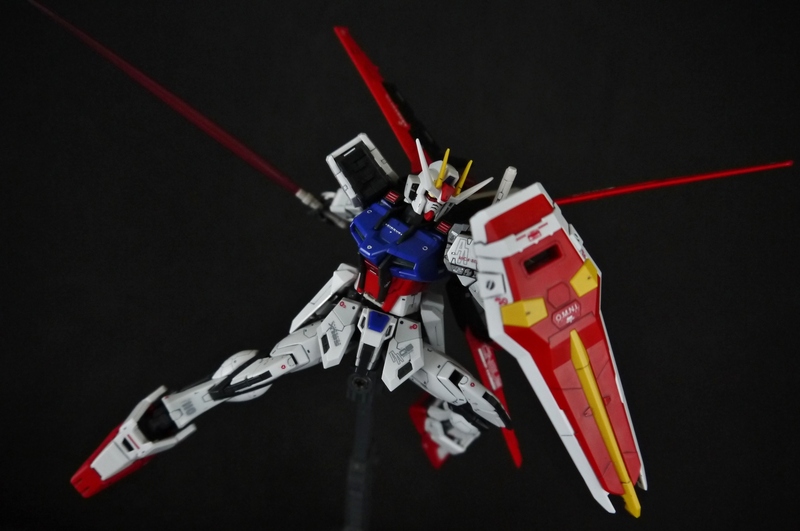 Before I forget to mention it, the RG Strike doesn’t actually come with an action base of its own – I’m not sure if any RGs do. However, I had some 1/144 bases left over from back when I actually collected HGs. 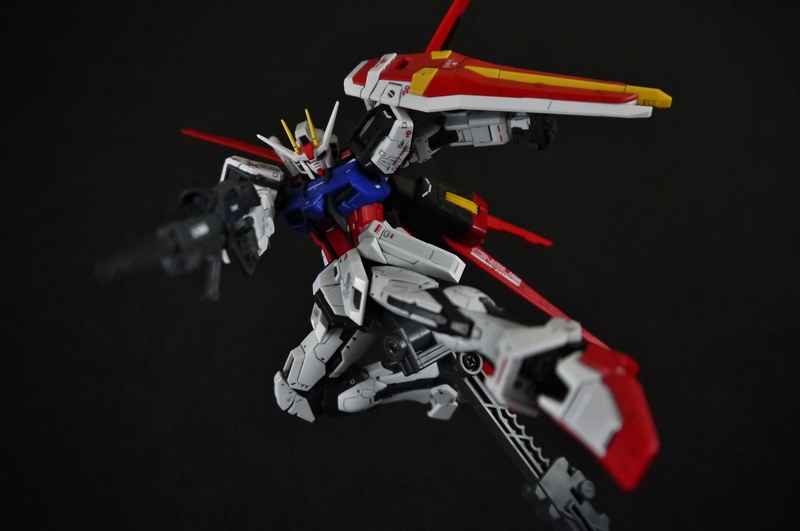 The Strike comes with an adapter specifically meant to attach from its crotch to one of these bases. Family photo, with the other RGs my pals built at the same time. Ordered from oldest to most recent, which would be the GP01. As I mentioned above, these all just look badass standing around. My friend’s grandaddy gave me shivers from my own attempt at it back in the day, but it seems he had better luck than I did on my first try. I have to say I’m really digging the bulk on the Zephyranthes’ legs. While I had them all together, I decided to try my hand at kitbashing. Figured it would be most interesting with three Real Grades. Now that I look back at it, I’m actually surprised my buddies let me tear their kits apart like this. I mean I put them back together later with no fuss no muss, but color me surprised. 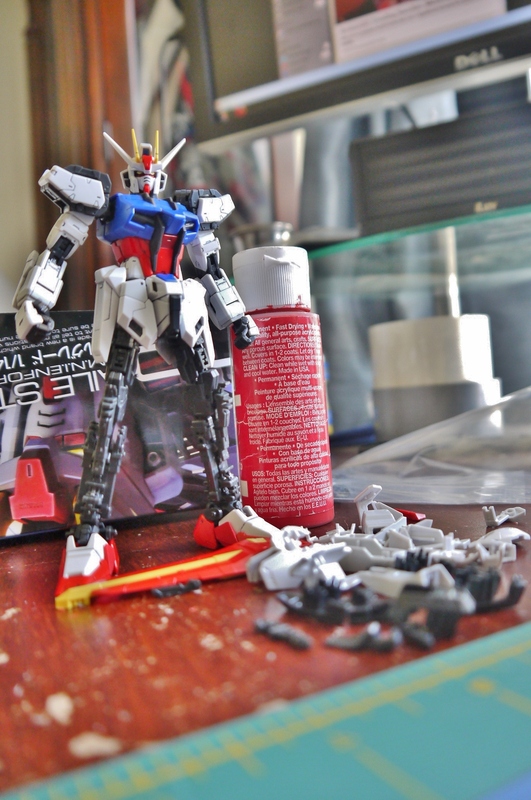 I call it… RG Build Gundam Custom. 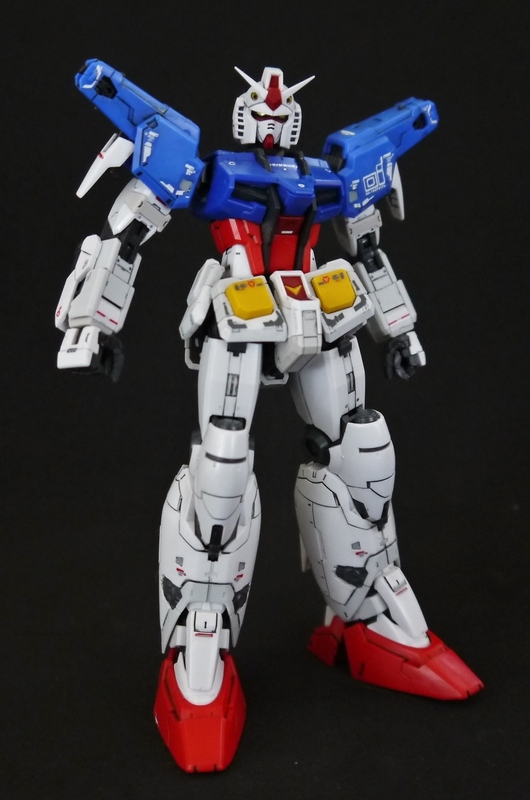 Notice how the Zephyranthes’ legs don’t actually fit into the RX-78-2’s waist. Guess they aren’t totally compatible after all. 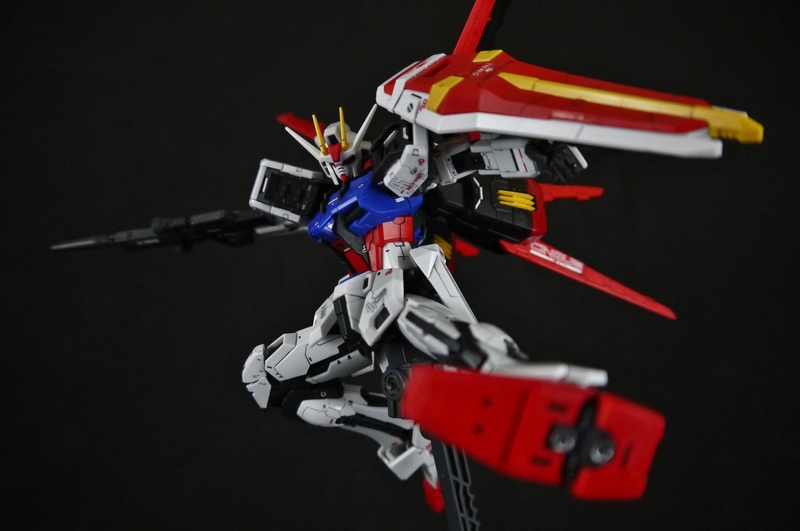 As my first Real Grade experience in quite a while, I have to say the Strike wasn’t all that bad – it certainly came out much sturdier than I feared it would be. Despite that though, I was reminded again of how tiny 1/144 kits are and how difficult they are to work with – their details also tend not to be as sharp as 1/100 kits, so I think I’ll continue to stick to the latter. 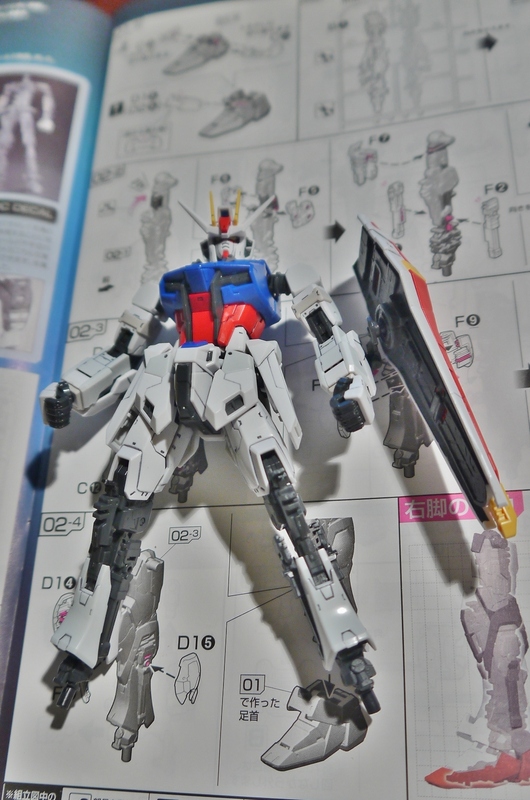 This kit has already been sold off, though I did enjoy the build process. 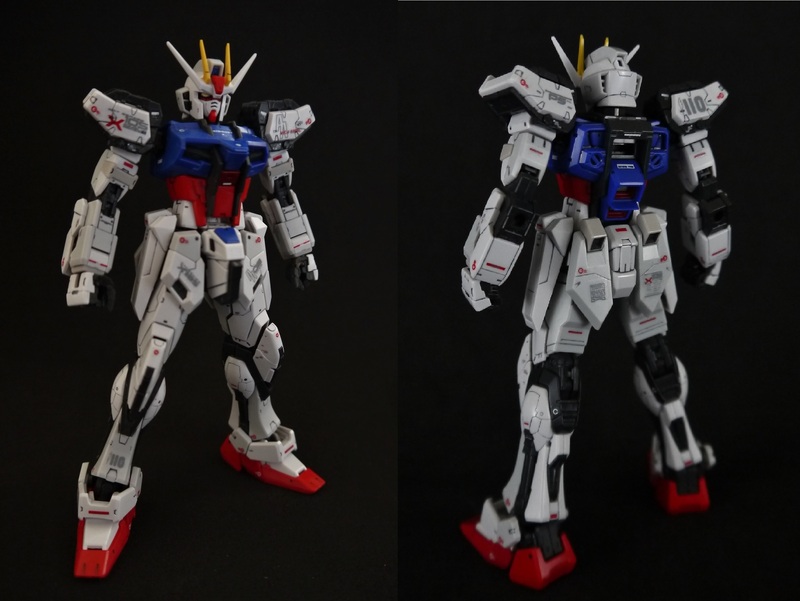 I’d say it’s a massive improvement from the first RG released, as the RX-78-2 was more or less just a guinea pig for the line-up; hopefully the miniscule technology used in these kits continues to improve with time.